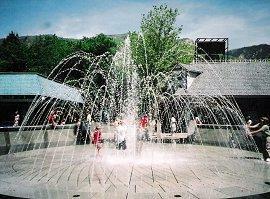 Lagoon's fountain is a fun way to cool off. Utah isn't well known for theme parks and traveling to this out-of-the-way state can be expensive for thrill-seekers, which makes discount travel to the Lagoon amusement park in Utah all the more important. Located in the northern part of the mountain west, Utah is naturally isolated from neighboring states and is far distant from more popular theme park getaway destinations such as Florida, California, and Ohio. At the same time, the state's family-friendly nature and stunning geography makes it a fabulous getaway with many popular attractions to enjoy along with the Lagoon amusement park. 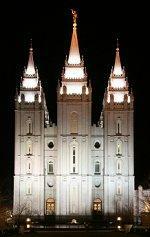 Temple Square: As the heart of the Church of Jesus Christ of Latter Day Saints, Temple Square in Salt Lake City has many attractions to educate curious visitors about the Mormon religion. Museum artifacts, detailed models, spiritual artwork, and beautiful gardens are only a few of the sites to see, and Temple Square is free and open to everyone. Guided tours are available for no charge. Bonneville Salt Flats: Located an hour's drive west of Salt Lake City, the Bonneville Salt Flats are the home of speed testing at its best. Anyone with a yearning for fast driving will enjoy seeing drivers attempt world records during the summer months. Raging Waters: This water park is located just southwest of Salt Lake City and includes a wide range of slides, a wave pool, and other wet attractions to cool off on hot summer days. Park City: This mountain resort town is well known during ski season, but Park City also offers unique shopping and dining experiences as well as luxury accommodations that often feature discount rates during the summer. Outdoor Activities: With dozens of national parks, stunning canyons, and well-maintained trails, northern Utah is perfect for anyone interested in camping, hiking, biking, climbing, fishing, or boating. These and other outdoor activities can be a great addition to a Lagoon vacation. With so much to offer in northern Utah, saving money on traveling to the state is critical to preserve a budget's integrity. By finding the best deals on transportation, accommodations, and park tickets, it is possible to save plenty of money to enjoy other activities as well. Just traveling to Utah is often the most expensive part of a vacation to Lagoon. To find affordable plane tickets, prospective guests should compare prices at different ticketing agencies, including Travelocity, Orbitz, and Expedia. Salt Lake City is the closest airport to the park (just 17 miles), and travelers may find the best deals through smaller airlines such as Frontier Airlines, which has regular routes that include Utah. Finding discount travel to the Lagoon amusement park in Utah won't be worthwhile if the stay itself is expensive. Fortunately, there are many affordable hotels located less than 10 miles from the park, and several of them also offer shuttle service to save guests traffic worries and parking fees. Many hotels also offer package deals that include discounted Lagoon admission tickets. Popular hotel chains near Lagoon include Best Western, Hampton Inn, Comfort Inn and Suites, Holiday Inn, Hilton, and Marriott. There are also several inexpensive campgrounds near Lagoon, including the park's own campground bordering the park's southern perimeter. 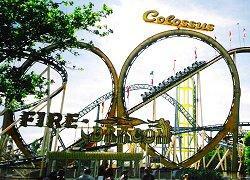 Finding discount tickets to Lagoon can also help make the vacation more affordable. Basic ticket prices are $42 for adults, $36 for children, $22 for toddlers, and $29 for senior citizens. Military discounts are available, and Lagoon offers discounts with specially labeled Coke cans. Date night specials offer a 2-for-1 admission price on Friday evenings, and bounceback offers are in effect during certain dates, giving guests the option to visit the park a second time for less than $10 after their first full admission. Is it really worthwhile to arrange discount travel to the Lagoon amusement park in Utah? Indeed it is, since the park offers a wide range of rides and other attractions for families to enjoy. The Rocket: This tower ride rises 217 feet in the air and either blasts riders upwards or plummets them to the ground with a force greater than four times gravity. Wicked: This launched coaster reaches 110 feet tall and rushes along at 55 miles per hour after a daring vertical launch. Sky Ride: This classic ski-lift style ride offers fabulous views and a relaxing treetop journey from one end of the park to the other. Colossus: The Fire Dragon: This coaster may seem small at only 85 feet tall, but the dual vertical loops are an exciting thrill for every rider. Lagoon also has many classic amusement rides, including a Scrambler, Tilt-a-Whirl, bumper cars, Ferris wheel, train, carousel, and a wide assortment of kiddie rides for younger guests. The central fountain is also a fun diversion with more than 130 powered nozzles that perform synchronized shows guests can interact with - with wet results! On a hot day, there is no better attraction than Lagoon-A-Beach, the included waterpark. A refreshingly chilled lagoon, lazy river, children's play areas, and an assortment of serpentine, speed, and tube slides make this a great way to cool off. In addition to these fun attractions, Lagoon houses an impressive collection of historical memorabilia in its Pioneer Village location, and guests can also enjoy entertaining shows in the central pavilion. The train ride travels through a small wildlife zoo that includes tigers, mountain lions, emus, kangaroos, and other animals.